Transit (moving) Jupiter is one of the slower moving planets, and stays in one sign for about one year. The aspects it makes generally last 1-2 weeks, but it usually stays in one house for around a year. Transit Jupiter can show areas where you have opportunities to do good things, expand your life, and bring some positive energy into your life. When transit Jupiter is in your 1st house, you feel optimistic about your life. You become more confident and feel good about the way things are going. This can lead to you making improvements in your life because you feel so good or want to feel better. You could be presented with new opportunities that will expand your life in some way. You may want to expand your life and experience more, seeing what the world has to offer you. You’re more friendly and gregarious, outspoken and blunt, and have a more happy attitude. You can do what you want and be who you are, and you don’t feel chained down. You do need to watch for being overly indulgent or lazy. This aspect can also lead to weight gain, though if you actually put in effort to lose weight, this aspect will make it easier. It’s just getting up and actually doing it that could be difficult. When transit Jupiter is in your 3rd house, you want to learn, and this aspect gives you the chance to learn as much as you can. You could take a class, go to school, or start learning something on your own to expand your knowledge. You’re more open with people, and can express yourself honestly. You may find yourself having many more communications than in the past, and you can articulate your thoughts and ideas well. Technology could be prominent during this transit, and you could buy new equipment or a new car. You may do more with your community, with your neighbors, or with a sibling, and could have opportunities presented to you thorough them. You could find yourself on the road a lot, but not going very far. You should be more sociable and enjoy spending time with people, and they like being around you with your positive attitude. 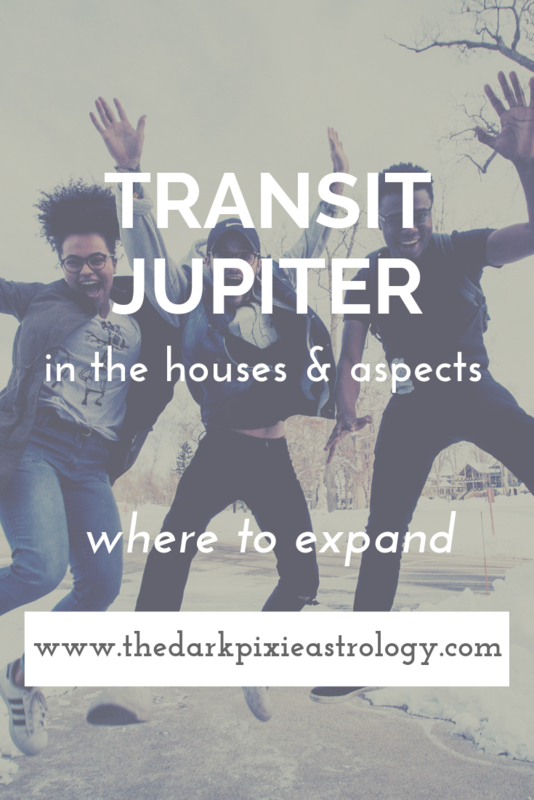 When transit Jupiter is in your 4th house, you could have the opportunity to expand your home in some way. Perhaps you put on an addition or knock down walls to make it feel more expansive. You want to have more freedom of movement at home, which is why you feel the need for a bigger place. You could buy a new place, or begin investing in real estate. You enjoy being at home now more than in the past, and enjoy spending time with your family, or at least try to improve your familial relations. A new member of the family could appear during this transit. You can also focus on strengthening your inner foundation, the very basic part of your that you build yourself on, and try to bring more stability into your life through that. You want to ensure that you have security that will last for a long time, and that you don’t have to worry about things falling apart anytime soon. You can also be more encouraging and supportive of your loved ones during this transit. When transit Jupiter is in your 5th house, you just want to have a good time, and good times should be had. You can enjoy yourself and do the things that you love most. You can spend more time on your hobbies, and take up new ones. If you’re creative, you can see your creativity soar, and this is an excellent aspect for artistic types. You can be inspired to create your best work yet. You may be prone to gambling, and some risks may go well, but don’t push your luck. You want to express yourself in some way, and let the world see you. You can be more sociable and if single, meet new romantic partners. You could fall in love during this transit, but if there aren’t any other grounding influences (like Saturn making some aspects), it’s most likely you’ll just date a lot. If attached, you could bring some romance back into the relationship. This can also be a good period to have a child/get pregnant, and if you have children, it can be a good period for them. When transit Jupiter is in your 6th house, you enjoy working and are much more productive and efficient than in the past. You know exactly what work needs to get done and in what order, and you do everything quickly and to the best of your abilities. You expect a lot from yourself, and may need to watch for perfectionist tendencies. You should get along better with coworkers, though you may want more freedom at work to do things your own way. You could move into a bigger office or workspace. This can be a good period to get a new job, or be offered several new job opportunities. You can handle your day-to-day affairs much more easily, and not find small tasks boring. This is also a great period for dealing with your health, and you can make great strides with health issues. Just make sure you’re eating well and exercising, otherwise you may gain some weight. When transit Jupiter is in your 7th house, you could do well with a partner. Personally, you may commit to someone, move in with them, become engaged, or get married, and you prefer being in a relationship over being alone. Professionally, you could take on a business partner and do very well together. Some sort of important partnership is likely during this transit. You’re happier in relationships of all kinds, and the people that you meet tend to be good for you. On the flipside, you could end a relationship during this transit, but it’s one that hasn’t been good for you and you’re glad to be rid of them. You’re better at making compromises, finding middle ground, and negotiating. You’re also more charming and good in social situations. If you have to appear in front of people, you can make a good impression on them. When transit Jupiter is in your 8th house, you’re more comfortable with the amount of power and control that you have in your life. You may want more and gain more, but you’re less likely to go about getting it in the wrong way, or manipulate people once you have it. You can do some digging into yourself and your deeply-held issues, and come to terms with issues from your past. This can be a great period of healing and growth, and you learn how to be more vulnerable and open to intimacy. This can also be a good period for your wealth, and you could gain more wealth if you make good decisions with investments, or through a partnership. You could settle a debt, loan, tax issue, inheritance, or problem with joint finances. Your sexual appetite expands, and you could have more partners, or spend more time with the one you have. When transit Jupiter is in your 9th house, he’s in the house that he naturally rules, so he’s quite at home here, and that’s good for you. This is a time where you can expand your life in some way, and have plenty of opportunities presented to you to do so. You’re usually much more optimistic and light-hearted, and don’t want to focus on anything too serious. Life is good, and you want to experience all of the goodness out there. You can learn something new, go back to school, get a degree, try teaching others, or get into writing. Dealings with the law go smoother. In business, you could deal with people from other places who help you, and promoting your work can be beneficial. You can see the big picture now, and because of this, you’re a lot less stressed over the smaller things that come up on a daily basis. You know things will work out just fine, and there’s no need to worry. When transit Jupiter is in your 10th house, you usually experience a good period for your career. You can be recognized for the work that you’ve done and make strides. If you’re in the public eye, you make a good impression. You could travel through your work, see an increase in your status because of your success, and be presented with opportunities through your elders (parents, bosses, mentors, etc.). You can do what you want in your career with greater ease, and you should try to put yourself out there as much as you can, because the more that you do, the more that you’ll get. You could finally achieve a goal that you’ve been working hard towards now, and it doesn’t seem as difficult as it has been. You can also create new goals for yourself that are bigger and more daring than you would’ve previously thought possible. When transit Jupiter is in your 11th house, you usually make new friends, and lots of them. Your social calendar is more filled than it has been for some time, and your new acquaintances can come with new opportunities for you. You could join a new group, or work hard towards a new cause that you pick up. The humanitarian in you comes out, and you want to help the world in some way. You could join a charitable group. Whatever you do, you want to be around people who share the same interest that you do. When you think of the future, you have a more optimistic attitude, and you’re hopeful that everything will go well. You could get an opportunity to make one of your dreams come true, or at least get closer to making one come true. You’re more open to things that are original, inventive, eccentric, and unique, and are willing to embrace your individuality. When transit Jupiter is in your 12th house, you can focus on the habits that you’ve taken on over the years and finally let go of them. You can be less self-destructive during this transit, and eliminate some of the baggage that you’ve been carrying around. You’re less afraid to get in touch with your hidden issues and bring them to the surface to deal with them. This can be a great time to start therapy of some sort. You may explore your spirituality and become interested in metaphysical subjects. You could take up meditation or some sort of spiritual practice. Your compassion expands and you try to help others through volunteer work or charity. You’re okay with doing things in the background that may not be noticed right now, and find that you prefer being out of the spotlight because you do your best in private. When you need help, it’s there, and this transit usually protects you during difficult times. With transit Jupiter conjunct your natal Sun, you can experience a time of opportunities being presented to you. It’s up to you whether or not you’re going to take those opportunities and do something with them or let them pass you by. You’re confident and it’s a good time to begin something new. You feel good physically and are positive, though your judgment can be off in some cases. With transit Jupiter sextile or trine your natal Sun, you can make plans for your future easily. This can be an especially good time for you financially, so take advantage of that. Your confidence is higher than usual, and you can deal with people more easily. You feel good, and you want to make your life better. Think about the ways you can improve your life and get them started. With transit Jupiter square or opposite your natal Sun, you may squander opportunities that are presented to you, and make poor decisions. You can be too confident and overly positive about situations. If you can overcome the intense good feelings that make you want to be lazy and do nothing, you can use this energy positively and make things happen for you, but it takes effort and you have to force yourself to take action. With transit Jupiter conjunct your natal Moon, expansion is the name of the game. Your moods raise and you feel optimistic about everything in life. Just be careful not to overdo it. You want to make happy changes to your home, and you may redecorate to make it reflect your upbeat mood or renovate to expand and make it larger. You can knock down walls and go for that open-concept feel, or move into a larger home. Strengthening your inner foundation is favorable, and you may want to make your relationships with loved ones, especially family, better. With transit Jupiter sextile or trine your natal Moon, you can usually be optimistic without being delusional about it. You find life to be more pleasurable, and try to have more fun. People see you as open and sociable, making them drawn to you. You may feel a lot better about yourself, even if you don’t quite realize it consciously, but it can permeate in everything you do. With transit Jupiter square or opposite your natal Moon, you’re prone to overindulgence, and this is a time when many gain weight (this is also possible with the conjunction, though you may have a better chance of controlling it, and you can turn it around and instead use the energy to lose weight). You may feel like your life isn’t good enough or isn’t what you want it to be, and overdo it with things to compensate. Difficult Jupiter aspects are usually not too hard to turn around and make positive if you’re willing, which is usually the rub since the square/opposition likes to make you lazy, and unlikely to try. With transit Jupiter conjunct your natal Mercury, you can step back and see things from a wider perspective, but can miss the details as a result. You feel positive about things, but you can become too positive. You can expand your mind during this period, learn something new, go back to school, or start a writing project. You can share your thoughts and ideas with people, and they usually respond well. This is also a good period for dealing with contracts and documents, writing, and speaking. With transit Jupiter sextile or trine your natal Mercury, you can take in new knowledge and information more easily. You focus on subjects that aren’t too serious, and feel good about life. You’re more curious about the world, and everything you see inspires you. With transit Jupiter square or opposite your natal Mercury, you have a hard time seeing things clearly or hearing what people tell you. You have to work harder to see the details, otherwise overlooking them will lead to major problems. Too much is going on, and it overwhelms your brain. You may feel pulled into too many directions, and it exhausts you mentally. With transit Jupiter conjunct your natal Venus, your creativity is heightened, and this is a good time to pursue creative ventures. If you’re happy at work, you’ll be even happier and do more work. If not, you can take some time off and enjoy yourself away from it all. Watch your spending habits. You want to indulge in your senses, feeling more sensual, and you feel good, really good. This can be a time where you start a new love relationship. With transit Jupiter sextile or trine your natal Venus, you can feel good, sociable, and generous, but you may not feel the impact of this transit too much if you don’t see it coming. It just ends up being a time where you feel a little better than usual. This is a good time to begin something new, meet new people, and pursue a money-making venture. With transit Jupiter square or opposite natal Venus, you’re indulgent, too indulgent. This can be a time of an expanding waistline. You feel lazy and have a hard time getting real work done. You could have a problem arise that prevents you from being able to work, have a financial loss, or see someone leave your life, even if only temporarily. With transit Jupiter conjunct your natal Mars, you should see a surge in energy and drive. You believe in yourself and your abilities which allows you to do more, but you can also attempt or promise more than you can actually accomplish. Be physically active and keep your body moving. Your confidence is higher, as well as your competitive nature. With transit Jupiter sextile or trine your natal Mars, you feel good, positive, and can get right to it. You want to be a little more bold and daring than usual, and can take some risks. You’re more assertive and can stand up for yourself. If opportunities are presented to you, you can go for it, and with your increased confidence, you can do well. With transit Jupiter square or opposite your natal Mars, you can be boastful, proud, and restless. You’re more reckless and need to make sure you’re not taking unnecessary risks. You want to expand your life in some way, so try to be more constructive about it. Get a handle on your energy and direct it towards something productive. With transit Jupiter conjunct your natal Jupiter, you experience a Jupiter return, which is when transit Jupiter returns to the exact placement it was at when you were born. A Jupiter return occurs every twelve years or so, and is usually a good period. You feel buoyant, and an opportunity could be presented to you. You can expand your life in some way and experience something new. With transit Jupiter sextile or trine your natal Jupiter, you feel optimistic and positive about your life, and can make good things happen for you, but you may feel too good to do anything. Try to make yourself so you can take advantage of the energy, otherwise it’ll pass without much happening. With transit Jupiter square or opposite your natal Jupiter, you can be overly optimistic and feel too confident, making you lazy and indulgent. You might shoot for something big but not put in any work to get it. Get yourself moving. With transit Jupiter conjunct your natal Saturn, your optimism is tempered, and you take a more realistic approach. You may seem pessimistic and serious about life. Try not to get too down, and work hard during this period. That hard work can turn into good things if you don’t let yourself become too pessimistic. With transit Jupiter sextile or trine your natal Saturn, you can work hard and be practical but still have a positive outlook on life, and the work you put in can expand your life in positive ways. Your optimism isn’t unrealistic, but you’re not too serious either. There’s a good balance here. With transit Jupiter square or opposite your natal Saturn, you may be doing things differently than you thought you would be, and you have to adjust to that. You may not be able to do what you want to do right now for some reason. You can become overly pessimistic when things don’t work out the way that you want, so you need to try to control that. Try to move forward with your goals but in a cautious manner. With transit Jupiter conjunct your natal Uranus, you need to break free and expand your life in some way that leads you to have more independence. You should embrace your individuality, and try new things that allow you to have new experiences. You’re more open to other people and other ways of living. You may experiment, but don’t go too far. With transit Jupiter sextile or trine your natal Uranus, you can come up with great, new ideas quickly, and you have mental clarity. This is a good time to start learning something new and opening up your mind. You could be presented with an opportunity to make advancements in your career, personal life, or with your finances, and it comes unexpectedly. With transit Jupiter square or opposite your natal Uranus, you may be attracted to things that are unusual just because they’re unusual, and you have a harder time figuring out what’s good and what’s not. You might want to make big changes, but that’s probably not a good idea right now because you’re not seeing the cons. Pull yourself back. With transit Jupiter conjunct your natal Neptune, you’re more generous, empathic, and helpful. Whenever you see anyone down, you’ll help them up. Your creativity heightens, and you need to express yourself in a creative way. This is a great time if you’re an artist of any kind. Your sense of reality isn’t great, so don’t make any long-term decisions now. With transit Jupiter sextile or trine your natal Neptune, you can do some volunteer work, join a charitable group, or help out a loved one with a problem. You want to give of your time and energy to help others, but you’re not as unrealistic about their flaws. You see them, but you don’t think they’re so bad. Your imagination is active, and you’re drawn to fantasy. With transit Jupiter square or opposite your natal Neptune, you have a hard time seeing the reality of any situation, who a person really is, or what’s really going on. You may think that you do, but you don’t. Put off important projects for when your mind is more clear. With transit Jupiter conjunct your natal Pluto, you strongly believe in your beliefs, and you’ll defend them against anyone who disagrees with you. You can expand your beliefs, and try to get other people to believe what you do as well. You may become interested in the mysteries of life and are good at researching and investigating. You want to get to the core of any matter. With transit Jupiter sextile or trine your natal Pluto, you can breathe new life into something, whether it be an aspect of your life, an object, a person, or yourself. This is a good time to undergo a transformation of some kind. You can also become interested in serious subjects, and deal positively with joint finances, taxes, debts, loans, or inheritances. With transit Jupiter square or opposite your natal Pluto, you can become too wrapped up in your beliefs, and fight against anyone who resists them even a little bit, going too far. Keep an open mind. You can be too serious, too obsessive, or too probing. It’s hard for you to let things go during this transit. Try to rehabilitate something instead.